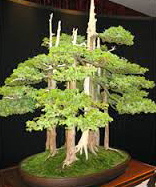 Goshin ("protector of the spirit") is a bonsai created by John Y. Naka. It is a forest planting of eleven Foemina junipers (Juniperus chinensis 'Foemina'), the earliest of hich Naka began training into bonsai in 1948. Naka donated it to the National Bonsai Foundation in 1984, to be displayed at the United States National Arboretum; it has been there ever since. The individual trees represent Naka's grandchildren. Goshin tree lives for more than 1000 yrs !!! Goshin means "self defence". If you learn to be self-reliant in life, you can live life to the fullest like a Goshin TREE.